During September we checked out a popular music event in a remote part of the United States, and for this Pléiades 1 – SPOT 6/7 Stadium of the Month we return to a sports theme, checking out the site of a crucial Big Ten college football matchup between the University of Wisconsin and the University of Michigan at Michigan Stadium, more commonly called the Big House. And as we mentioned last month, the author of this piece is still in the midst of recovering from wrist surgery so this will be a short but sweet look at the Big House! 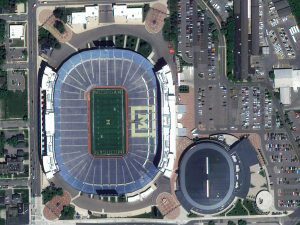 A 50-cm color image of The Big House in Ann Arbor, Michigan, USA collected on May 25, 2018 by Pléiades 1A; and then a 1.5-m SPOT 6 image of the same stadium collected just a day earlier on May 24, 2018! These images have custom processing and color balancing applied by Apollo Mapping. PLEIADES © CNES 2018, Distribution Airbus DS. SPOT © Airbus DS 2018. About the Venue: Michigan Stadium, or affectionately referred to as the Big House, is located on the campus of the University of Michigan in picturesque Ann Arbor. Officially opened for Big Ten football on October 1, 1927, the Big House has grown in capacity over the years, from just 72,000 in 1927 to 107,601 since 2015. Once featuring a natural grass field, from 1969 to 1993 and then again from 2003 to the present, the Big House featured artificial turf; and in 2018, the FieldTurf installed in 2003 was replaced. Fun Factoids: (1) On October 13, 2018, the University of Michigan and University of Wisconsin football teams will face off at the Big House with the winner of the game surely getting a huge boost on their resume to play in the National Championship playoffs. (2) According to Wikipedia, the Big House is the second largest stadium in the world, second only to Rungrado First of May Stadium we featured here in the past. (3) When constructed in 1927, the Big House cost just $950,000 to build which is just over $13 million by today’s standards, what a deal! (4) The University of Michigan installed an electronic scoreboard in 1930, making it the first stadium in the world to feature a digital game timer. 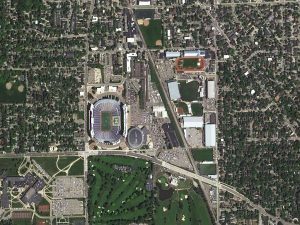 This entry was posted in The Geospatial Times and tagged featured products, Michigan, Pléiades 1 Stadium of the Month, The Geospatial Times by Apollo Mapping. Bookmark the permalink.